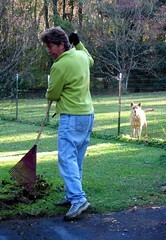 Title Nine girl and her dog working in the yard. It’s been a beautiful clear fall day but a bit cold. We think Haleakala really enjoys this colder weather, even it it makes a visit to the vet for annual shots.